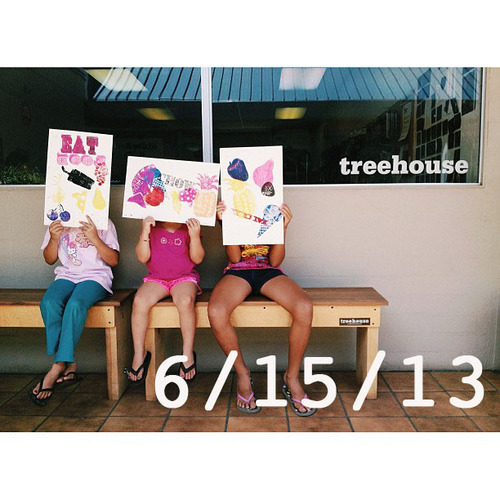 On Saturday, June 15 the Honolulu Printmakers presented a youth printmaking activity at Treehouse, a creative arts shop in Kaka’ako. 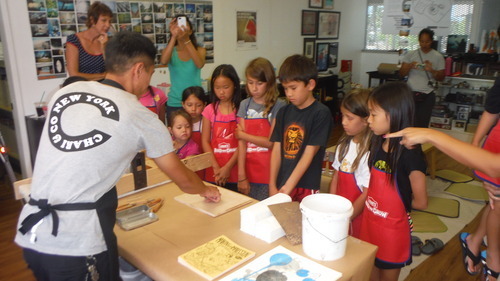 HP members Jeremy Pang, Kelsey Hughes, and Janice Vitarelli Miyoshi led the food-themed workshop for 10 very engaged kids, who were able to try their hands at making relief prints from pre-cut blocks on a real printing press. By all accounts, and based on the prints I saw, this was a very rewarding and successful saturday morning! Many thanks to Treehouse owner Bobby Asato for inviting us in. Please consider checking out and supporting his very cool shop. Also, Bobby made a very generous donation to Honolulu Printmakers of the proceeds from the workshop, which will be used to support one of our journal subscriptions. And again many thanks to the volunteers who made this happen, including Paul Weissman who helped cut blocks. All HP members and friends are encouraged to get involved in our outreach activities. This is how we build and sustain creative communities. Contact me (duncan@honoluluprintmakers.org) with ideas or if you want to help out.